This elegant and refined oval-shaped basin has a shallow body sitting on four short legs in the 'ruyi' sceptre design. Two 'chi' dragons with arched bodies are cast on to the long sides of the bowl, serving as handles. 'Ruyi' (literally meaning 'as you wish'), was the name given to a sceptre first popular in the Six Dynasty period (220-589), and often depicted in Chinese art being held by learned men of the Confucian, Daoist and Buddhist religions. 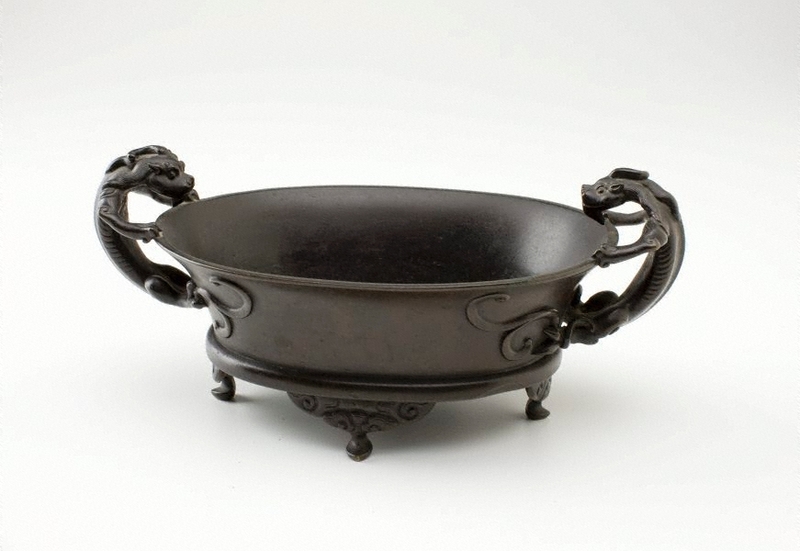 This type of Xuande (1426-1435) bronze was a favourite adornment of scholars' studios, so much so that by the late Ming dynasty, many had been widely copied – a tradition that continued into the Qing dynasty.